На фото: Собор Святого Павла (St Paul's Cathedral) - Лондон, 2012. Собор Святого Павла (St Paul's Cathedral) — англиканский собор, посвященный апостолу Павлу. Находится в верхней части Ладгейт Хилл, самой высокой точке Лондона, и является резиденцией епископа Лондона. Собор был построен по проекту архитектора Кристофера Рена (Christopher Wren). Работы были начаты в 1675 году и завершены в 1708 году. The cathedral is one of the most famous and most recognisable sights of London, with its dome, framed by the spires of Wren's City churches, dominating the skyline for 300 years. At 111 m high, it was the tallest building in London from 1710 to 1962, and its dome is also among the highest in the world. 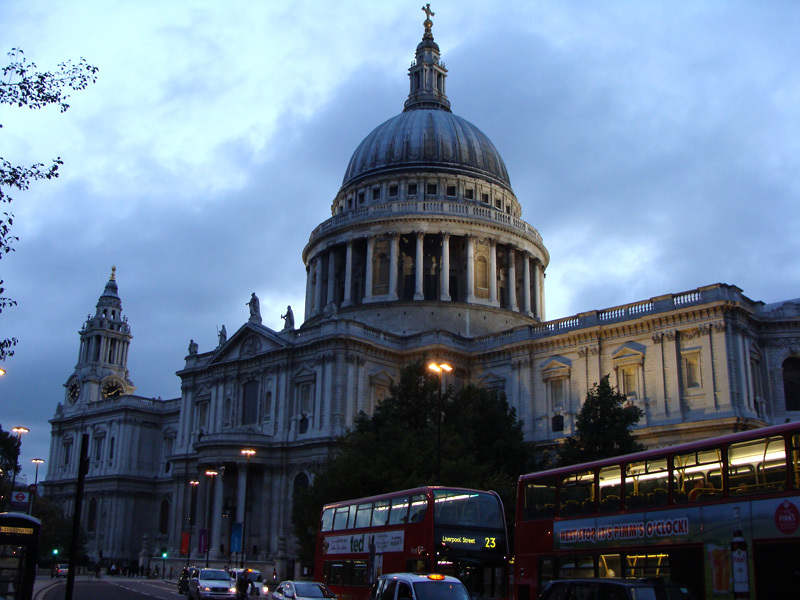 In terms of area, St Paul's is the second largest church building in the United Kingdom after Liverpool Cathedral.